Lower lip: Fold in half, make sure points of hexagon align and close with sc. sc to lowest point, ch1, turn, sc back to center. 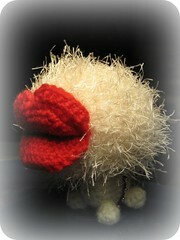 Fasten off, leave tail for lip shaping. Work other side from bottom corner to center in the same way. Sew legs and tail to body. Make sure the legs are spread rather far apart, to provide stability. tiny body will depend on bending the doll a little bit. 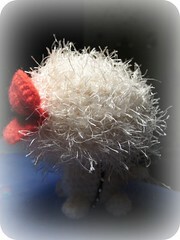 Shape upper lip by securing the ends of red yarn, then attach lips to head. Join collar under the body and secure the ends.